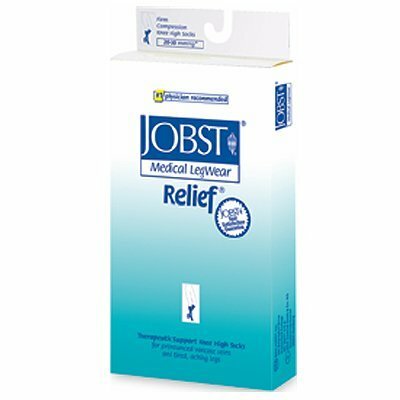 (SEE AVAILABILITY ABOVE FOR ESTIMATED DELIVERY) - Jobst Relief Medical Legwear, Thigh High Open Toe - 20 - 30mmHg, Size: XLarge - Jobst Relief Medical Legwear, Thigh High Open Toe - Quality & therapy at a moderate price. Now available in moderate & high compression. Moderate compression of 20 - 30 mmHg for moderate to severe varicosities, post surgical, post sclerotherapy, moderate edema & to help prevent recurrent venous ulcerations. High compression of 30 - 40 mmHg for sever varicosities & edema, post surgical, post sclerotherapy, lymphatic edema & management of active or to help prevent reoccurrence of venous ulcerations . Machine wash & dry nylon/spandex knit. Knee high, closed toe. Beige. Unisex. Sold in pairs. Latex freeSizeThigh Circ:Small15 3/4" - 24 3/8" (40 - 62cm)Medium18 1/8" - 27 1/2" (46 - 70 cm)Large21 1/4" - 30 3/4" (54 - 78cm)XLarge23 5/8" - 32" (60 - 81cm) - Rolyan products are internationally licensed & manufactured for home & clinical use. Most of their products offer a lifetime warranty.